Atopic Dermatitis, also called Eczema, is a term used to describe a group of persistent or chronic conditions that cause inflammation of the upper layers of the skin. It is usually itchy. Atopic eczema (or atopic dermatitis) may have a genetic component and tends to be found in families with a history of hay fever and asthma. It usually appears on the face, scalp, neck and on the side of the limbs in infants, as well as inside the elbows and behind the knees in older children and adults. Contact dermatitis occurs in two forms: allergic and irritant. Allergic contact dermatitis is usually a delayed reaction to an allergen, such as poison ivy. Irritant contact dermatitis is more common and is the result of a reaction to an irritant. For example, sodium lauryl sulfate (found in some personal care products such as shampoo, soaps and toothpastes) is one of many solvents that can cause skin irritation. Xerotic eczema, also known as winter itch, begins as dry skin, usually on the limbs and trunk, and becomes so severe it turns into eczema. This condition occurs most commonly in the elderly, but young people can also develop it. Seborrhoeic dermatitis is often referred to as dandruff, or cradle cap in infants, and affects the scalp and eyebrows and at times along the sides of the nose. Dyshidrosis is typically seen on the palms, soles of feet and sides of fingers and toes. It is characterized by tiny fluid-filed blisters (vesicles), thickening and cracks that itch, especially at night. Warm weather and stress make the condition worse. Discoid eczema most frequently appears on the lower legs as round patches of dry, cracked skin that sometimes oozes fluid. The cause is unknown. Venous eczema, or stasis dermatitis, is most commonly seen in people over 50 with poor circulation, varicose veins and edema (swelling). It is characterized by redness, itching, and darkening of the skin. Autoeczematization, or “ids,” usually occurs as a result of an infection by parasites, fungi, bacteria or viruses and always develops some distance from the initial infection. 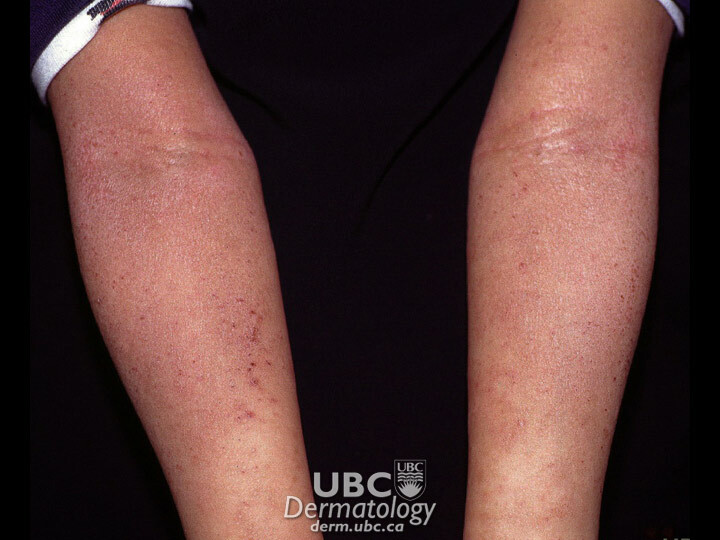 The type of infection that causes this condition determines how it looks, so the appearance of autoeczematization varies. The only way to cure it is by eradicating the initial infection. Neurodermatitis develops when persistent scratching irritates the skin. It is thought to have emotional or “nervous” causes. This condition is controlled with antihistamines and corticosteroids as well as behaviour modification (e.g., learning to stop habitual scratching). Atopic Dermatitis is one of the world’s most frequently diagnosed skin conditions. It is particularly common in young children and infants: 10 to 15 per cent of Canadian children under 5 are affected. Though some infants outgrow the condition by their second birthday, 40 per cent live with it throughout adulthood. About 10 to 20 per cent of the population lives with Atopic Dermatitis in one form or another. 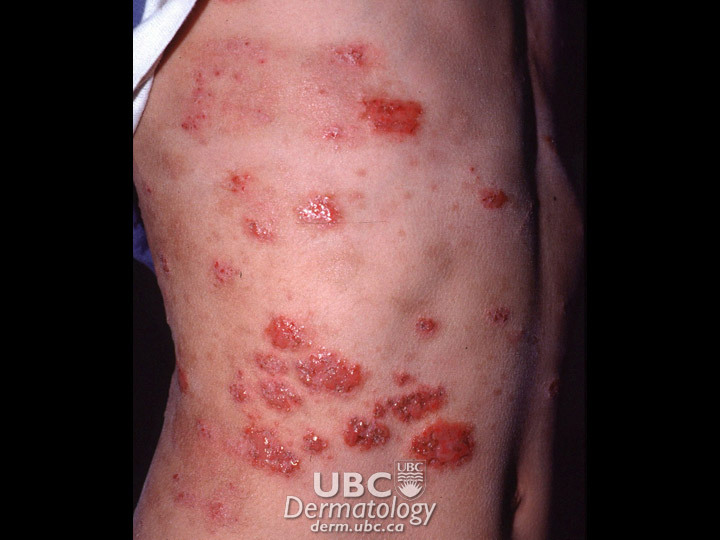 The number of people with Atopic Dermatitis in Canada is higher than the worldwide average. There are two theories about the causes of Atopic Dermatitis. The first is that a person with atopic dermatitis is predisposed to excess inflammation. This is caused by the type of inflammatory cells present in the skin, the types of chemicals these cells make, and the way they communicate with other cells. The excess inflammation caused by these cells and their chemicals leads to itchy, red, swollen skin, which sets the stage for irritation and infection. The second theory is that a person with atopic dermatitis has skin that does not provide the same protection as a healthy person’s skin. This allows foreign molecules to gain entry to the skin’s deeper layers, provoking inflammation, which causes skin itching and redness. Both theories are most likely interlinked. 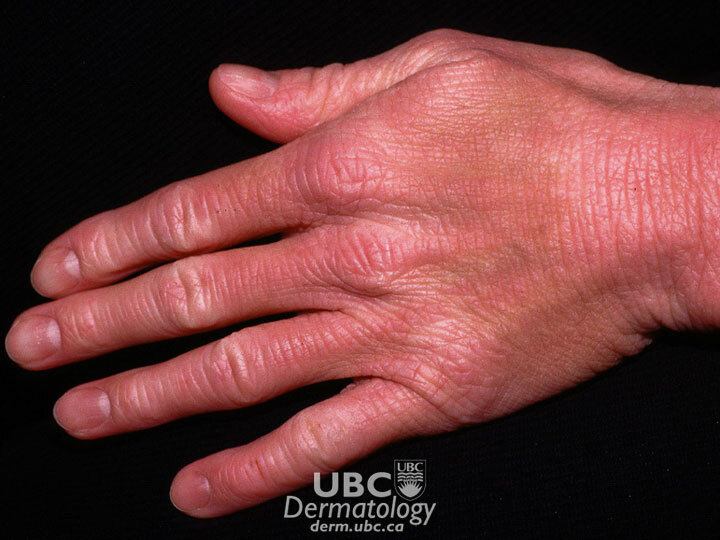 The causes of atopic dermatitis are still not fully understood; fortunately, international and Canadian dermatology researchers continue to work on this puzzle.